With a starting five made up of Jimmy Butler, Joel Embiid, Tobias Harris, J.J. Reddick and Ben Simmons, the Philadelphia 76ers have the most talented group of starters in the NBA outside of defending champs Golden State. But, unlike the Warriors (who start All-Stars Steph Curry, Klay Thompson, Kevin Durant, Draymond Green and DeMarcus Cousins), Philly’s bench is about as deep as a puddle in the desert baking in the California sun. That bench is made up of Jonah Bolden, James Ennis III, Amir Johnson, Furkan Korkmaz, Boban Marjanovic, Haywood Highsmith, T.J. McConnell, Shake Milton, Greg Monroe, Jonathan Simmons, Zhaire Smith, Mike Scott and Furkan Korkmaz, whose claim to fame is winning the Turkish basketball league’s dunk contest in 2016. There’s a good reason for that. Going by the player efficiency rating (PER) metric, which measures a player’s per-minute performance adjusting for pace, McConnell, Simmons, Bolden, Ennis III, Johnson, Korkmaz, Highsmith, Milton, Smith, Scott and Korkmaz all have a PER which ranks below the set league average of 15. The only two bench players who are above average according to the metric, Monroe and Marjanovic, are mainly ranked that way because their floor time has been extremely limited and they’ve only logged 25 games between them. The lack of star power, or even adequate NBA journeyman power, off the bench is directly related to what Sixers are paying out in salary to Butler ($20.4 million), Embiid ($25.4 million), Harris ($14.8 million) and JJ Reddick ($12.2 million). Since Simmons is still on his rookie contract, he’s only making $6.4 million, which makes the 22-year-old a relative bargain. However, even with that low (by NBA standards salary), Simmons is still making more than any bench player besides Marjanovic ($7 million) and should probably be paying for Monroe’s dinner on the road as the veteran big man is only making $59,820 in Philly. This is a slam-dunk example of getting what you pay for as the production Philly is getting from its bench is downright laughable. All five starters are averaging at least 17 points per game, but the 76ers do not have a single bench player averaging in double figures, with Scott, who spent most of the season with the Clippers before arriving in a trade, coming the closest at 7.8 points per game. Scott is by no means awful, but his claim to fame is sipping, not scoring. Following Scott in bench points are McConnell (6.4 ppg), Korkmaz (5.8 ppg) and (Jonathan) Simmons (5.5 ppg). As opposite-day Larry David would say, pretty, pretty, pretty bad. Obviously, points aren’t everything and players can help their team in other ways like getting tough rebounds, playing good defense and distributing the ball, but no one off of the Sixers bench does any of those things all that well either with the partial exceptions of Marjanovic (5.1 rebounds per game) and McConnell (1.0 assists, 3.4 assists per game). Basically, the 76ers have a tiny bit of scoring help off the bench from Scott and a fairly capable backup point guard in McConnell and that’s it in terms of production from the pine. That’s a recipe, that if it works in the playoffs, will set a precedent. To have success in the postseason, it’s traditionally been essential to have at least a couple of players who can come off the bench and produce when the starters need a spell. 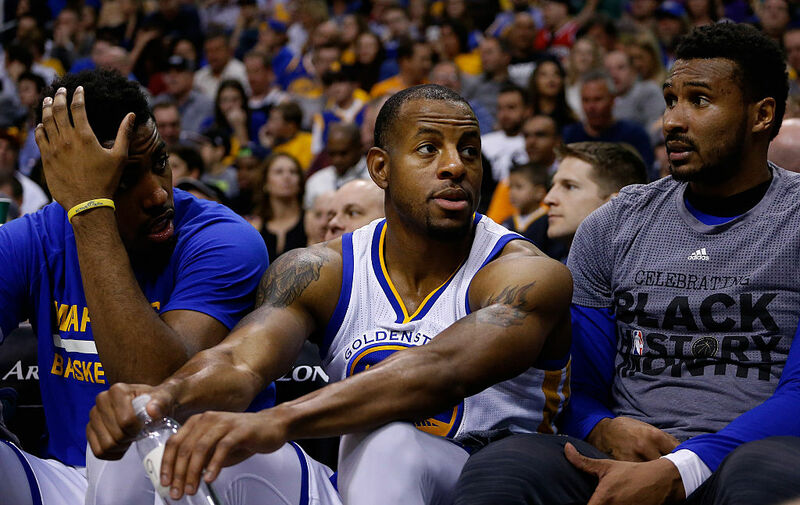 Last year’s champs, the Warriors, had 2015 NBA Finals MVP Andre Iguodala, Shaun Livingston, Nick Young and JaVale McGee at their disposal. While none of them are All-Star- caliber players (Iguodala was at one point), all four have been starters in the league at some point and offer much more than anyone on Philly’s bench. The team that won the championship prior to Golden State, the Cavaliers, were also top heavy with LeBron James and Kyrie Irving doing the heavy lifting in the playoffs, but they were buoyed by a bench featuring veterans Channing Frye and Richard Jefferson, as well as jack-of-all-trades Matthew Dellavedova. A look at the rosters of the rest of the most recent NBA champions reveals more of the same. The Spurs had Boris Diaw, Manu Ginobili and Marco Belinelli coming off the bench for their most recent title. The Heat, during their back-to-back Heatles championship runs, had Shane Battier, Mike Miller and even Ray Allen coming off the bench at times in the postseason. The Mavericks had Jason Terry, J.J. Barea and Peja Stojakovic as reserves during their championship year. And on and on it goes. If a team raises the Larry O’Brien Trophy at the end of the year, they need at least a couple of guys that come come off the bench and give the starters some room to breathe. That’s how it has almost always been. The Sixers don’t have anyone on their bench who is in the same league as Ginobili, Allen or Terry, nor do they have anyone who is even in the same as Battier, Stojakovic or Belinelli. They did last year — when Belinelli was actually on their roster — and even then Philadelphia was woefully thin behind their then-starting five of Embiid, Simmons, Reddick, Dario Saric and Robert Covington. That didn’t take long to catch up to the Sixers as they were bounced in the second round of the playoffs by the Boston Celtics, who were playing without Gordon Hayward and Kyrie Irving but were deep enough — with a bench including Marcus Morris, Marcus Smart (both of whom started for Boston much of this year) and Shane Larkin — to dispatch Philly in just six games. While there’s no guarantee having a second unit led by Scott and McConnell will burn Philly the same way having one anchored by McConnell and Belinelli did in the playoffs last year, it is a distinct possibility. And, though it probably won’t happen, it wouldn’t be shocking for the lack of a bench to bite Philly as early as the first round when they take on a Brooklyn Nets team that has nine players on its roster who have started at least 20 games for the club this season. The Nets might not be overly talented, but they are deep as are the Sixers presumptive second-round opponents if they make it that far, the Toronto Raptors (eight players with at least 10 starts this season). If Philly can somehow survive in the playoffs sans a productive bench, they’ll be bucking the odds and years of NBA tradition. Will they do it? I wouldn’t bet your cheesesteak — or roast pork hoagie — on it.